‘You will experience considerable pressure to conform to cultures of the firm, the set of chambers, the government department, and the faculty. This collective embrace is appropriate in so far as it educates, encourages and helps maintain proper professional standards. But never forget that as individuals you have the opportunity to project your values and your ideals into your chosen calling. Conversely, your personal wellbeing and the integrity of your life and belief system are vital to your ability to function as a legal practitioner. This speech and this statement have stuck with me since I first heard those words in 2014. That was about one year after I had begun my active pursuit of happiness. And to hear such successful members of our profession speak of the need to be ‘a person first and a lawyer second’ gave me the courage to be just that – to be Clarissa the whole person first, and a lawyer second. Among all of the happy lawyers that I have come to know, I have found a common theme – they have all found a way to be themselves in the work that they do. They are authentically themselves everywhere they go. They are the same person both at work and at home and they want it no other way. They are just happy being themselves. When I started law school, I thought that being a lawyer involved smart black and navy suits, corporate offices with expansive views, probably earning lots of money and working really hard. I took my first ‘proper’ job in a law office three years into my degree and very quickly realised that my expectations of what my career would be like and what it would actually be like couldn’t have been much further apart. My first day in a law office (if you ignore my couple of weeks working with a big firm in their mail room) involved a teeny tiny office, piles of files on the floor, no view and a lot of time at a photocopier that only worked some of the time. I realised pretty quickly that my life as a lawyer was not going to be all that glamorous. And you know what? I was okay with that. I worked out pretty quickly that my job in those first few years was to learn as much as I could as fast as I could. For me, being in a tiny firm was the best place to be doing just that. From the start, I was lucky enough to be working under a lawyer who did not necessarily fit into the lawyer stereotype. While there were times that his disorganisation drove me insane, there were many lessons I learned in those first few years that I will always be grateful for. I was encouraged early on to be independent, to be myself and to create my own career path. The great thing about all of us is that we have strengths. Sometimes the trick is working out just what they are! When it comes to the stuff we are great at, we often don’t even realise we have a natural talent for it – it just comes easily to us. We learn from a young age that being great at something must involve hours and hours of hard work, and so the stuff that just comes naturally can’t be useful or valuable. There will be a long list of things that you are just great at, often without even having to think or try too hard. They are your strengths and you should play to them. Back in 2013, when I started writing, I had no idea that so many wonderful opportunities were to come. From new friendships to new business to a whole community of wonderful people who are interested in my thoughts and feelings, my crazy decision to start writing has opened up a world of fun for me, all because I was playing to one of my strengths – creativity. The business world has changed more in these past ten years than, I think, in the many decades before, and this is never more obvious than in law. The way we now practise, thanks to the internet and the ‘information age’, is significantly shifting everything about our jobs at a rapid pace. Gone are the days of we lawyers being the holders of all legal knowledge. Now I can Google ‘How do I get a divorce in Australia’ and up jumps a myriad of helpful resources that largely tell me the answer. Our role is changing fast and we need to be on the front of the wave of change if we want to survive. And here is where this authenticity thing really kicks in. Almost every encounter you have with a new client, new employer, new contact or new colleague starts with a Google search to see what you can learn about them and what they can learn about you. Our digital footprint is growing exponentially, despite lawyers being some of the slowest to embrace this new way of doing business. So just in case you were questioning this notion of authenticity, I encourage you to embrace it not only because it is so much easier to be yourself than anyone else, but also because the sooner you do, the sooner you will be able to embrace and enjoy the modern online business world and develop a personal brand that will be your currency in the ‘new law’ world. My first proper mentor in law taught me very quickly that your reputation is your most valuable asset as a lawyer. It takes many years of hard work to build and can be lost in a second if we don’t protect it vigorously. Our reputations can of course be constructed to a point, much like you can construct a personal brand. However, if you are trying to construct a brand or reputation that is not an authentic representation of who you really are at your core, then I suggest your hard work will probably be in vain. To build a strong reputation in law, I suggest you need to start by being a great lawyer. There is little point having a wonderful sales and marketing process, beautiful branding and stunning business model if, at the end of the day, you cannot deliver the legal service you are ‘selling’. Whatever area of law you have chosen to pursue, be great at it. This doesn’t necessarily mean being the best at it. It means knowing your law, knowing it well, spending the time in the early part of your career submerged in reading legislation and cases, and watching those around you – not requiring them to teach you, but taking the initiative and learning regardless. Being a great lawyer means building a reputation for honesty, integrity and constant learning. Those great lawyers who have been my mentors, some of whom are now Judges, are learning even now. They’re still attending courses and conferences, and sitting and talking with people who have different skills and knowledge from them. They are massive sponges who never stop taking in information. The world is changing; technology is changing. There has never been a better time to learn. So whatever stage you’re at, take advantage of the times. Be a great lawyer. Make that the core of your brand and your reputation and never let that go. It takes courage to be yourself in a world that is full of expectations, stereotypes and social norms. Being clear about your core values and ensuring your decisions are congruent with those values is a big step in building that courage. Follow your intuition or ‘go with your gut’, as they say – it will generally lead you to ‘you’. Be careful whom you surround yourself with – you need people who lift you up rather than pull you down. And don’t be afraid to say ‘no’ when something just doesn’t feel right to you. Shakespeare famously said, ‘…there is nothing either good or bad, but thinking makes it so.’ We need to remember that we are both the source and the cause of our own wellbeing. Your thoughts, feelings, beliefs, values and strengths make you ‘you’, so why not mindfully create a life that fits with ‘you’ rather than fighting against it every day? I promise you the former will give you the greater chance of happiness. No one is you-er than you! We lawyers need to find a way to be comfortable in our own skin – to be authentically ‘us’. Sure, there may be parts of our personality that don’t fit best at work, but the thing is, the minute you allow yourself to be ‘you’, with all your strengths and challenges, you will be surprised how much happier you start to feel. You are one whole person with so many valuable parts. Being a lawyer is only one part of who you are. Embrace that; don’t try to isolate it. But, more importantly, don’t isolate all the other great parts of you from the ‘lawyer’ in you. No one is you-er than you. Rather than trying to spend your days being someone or something else, I encourage you to just be you – whoever that is- and never forget, you are a person first and a lawyer second so be ready to embrace that for all that it means to you. Clarissa Rayward is the Director of Brisbane Family Law Centre and the Author of the book ‘Happy Lawyer Happy Life- How to be Happy in Law and Life’. 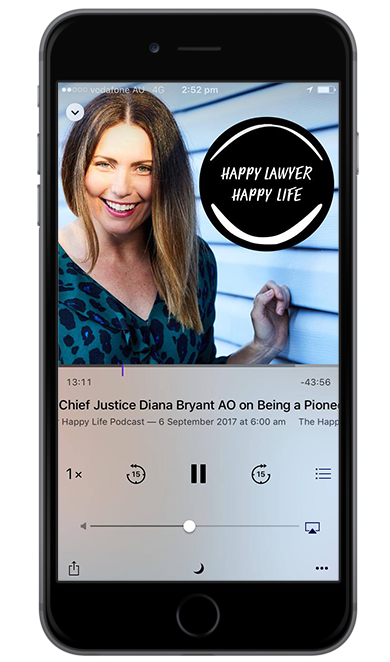 Clarissa is tackling the challenging issue of unhappiness in the legal profession through her writing and weekly Podcast ‘Happy Lawyer Happy Life’ where once a week she interviews lawyers who have found a way to maintain a successful career in the law while not giving up their life outside of their career. In January 2017 Clarissa launched the first ‘Happy Lawyer Happy Life’ online course, helping lawyers nationwide to better understand how they can drive happiness in their careers over an 8 week period.